TRC #449: Why Use Stop In Telegrams? + Ask An Astronomer ft Dr. Stuart Robbins + Do Babies Look Like Dad To Avoid Abandonment? Your weekly dose of fun and facts is back with a brand new episode! Cristina takes on a twitter question about the use of the word ‘stop’ in telegrams and busts some old myths in the process. Our favo(u)rite resident astronomer Dr. Stuart Robbins returns with an update on New Horizons and to impart more wisdom about vacuums, and virtual particles. New dad, Adam, investigates whether babies resemble their Fathers more than their Mothers. And speaking of Moms, Happy Mother’s Day! Why Use Stop In Telegrams? Do Babies Look Like Dad To Avoid Abandonment? This entry was posted in The Reality Check Episodes and tagged astronomy, Babies, genetics, Stop, Stuart Robbins, telegram. Bookmark the permalink. 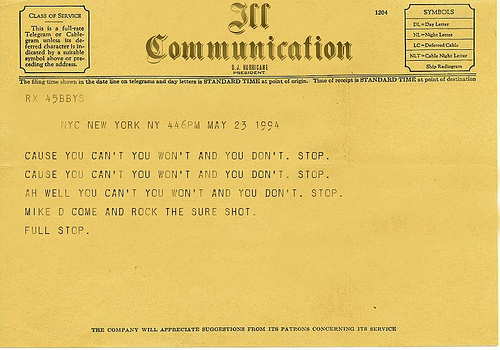 4 Responses to TRC #449: Why Use Stop In Telegrams? + Ask An Astronomer ft Dr. Stuart Robbins + Do Babies Look Like Dad To Avoid Abandonment? Hi, dear every one at TRC! This is my first message to you though I’ve listening to your podcast for over six or seven years in Japan and am really enjoying every single minute of every single show. About telegrams, I’m writing in response to Producer Pat’s comment that he read somewhere that telegrams are still alive and well in Japan. Yes, telegrams are used as a sort of rare and decent greeting cards mostly on social events. Post office offers products like a telegram sent with a bouquet, with a photogragh, and even with a sweet delicacy. For example, politicians send congratulation telegrams when there’s an entrance ceremony or a graduation ceremony at a school in their constitucncy, or company presidents or executives send one when one of their employees is having a wedding party. Consolation telegrams are sent at funerals. Having said that, we rarely come across a telegram personally in daily life. I’ve never seen anyone exchanging telegrams on personal basis. My close encounters with telegrams were only at ceremonies at school and when the MC read out numerous telegrams one by one, that was the most boring part of the ceremony, together with long and tedious speeches. Hope every one of you guys well and keep on entertaining my ears and opening my eyes. Thanks a lot! Thank you for the comment, Eiten! When editing the show I went and dug up the article I had read. The description of the use of telegrams in Japan in that article pretty much fits exactly with what you describe. Good to know I got it mostly right. A gene coding for a growth factor IGF2 is thus active from the paternal chromosome 15 and silent from the maternal chromosome 15. To counter the surplus growth factor in the foetus, another gene is active from the maternal chromosome 15 and silent from the paternal chromosome 15. Loss of the maternal imprinting will cause the Angelman syndrome, while loss of the paternal imprinting will cause the Prader/Willy syndrome. The chromosome sequences can still be normal in the affected children. For the husband, it could be advantageous to identify his genetic children in whom he might invest more ressource, but for an extra-marital father it would be more advantageous if the husband does not recognize a child not to be his biologically. Or then there would be a selective advantage for the mother’s chromosomes to prevent this recognition. So I don’t think there would be such a mechanism here. Thanks Jean-Marc. We got an e-mail about this same idea as well. This would certainly make for an interesting follow up topic for the show. As for it needing to benefit the father it’s hard to tell. It only needs to benefit the baby. Even if it’s bad for the would be cuckolded father he may still have genes for it if they were selected for when he, or one of his ancestors, was a baby. I think it comes down to a risk/benefit on the baby’s behalf and we’d need to factor in likelihood of legitimate fatherhood in this case. It’s weighing a potential minor gain vs. a potential catastrophic loss if the resemblance isn’t there, so I think there wouldn’t be a strong pressure for it.